Before the start of CES 2018, the only real smart speakers with a display were the Amazon Echo Show and the Echo Spot. But now that Google has partnered with several manufacturers to make a whole line of Echo Show rivals, a bona fide new device category has been born: the smart display. And based on the devices revealed this week, I believe the smart display will slowly start to outnumber smart speakers and will likely be the norm going forward. The simple reason for this argument is that the display makes such devices much more useful. Sure, you could have Alexa or Google Assistant tell you there's a Starbucks 1.5 miles away from you. But wouldn't it be nice to actually see where it is on a map? Or if you wanted to know the time, you could just, you know, look at the screen. Or if you wanted to know who the artist of the song is but couldn't be bothered to interrupt the track, you could do the same. That extra visual layer is really useful, especially for quick, glanceable information. Of course, you could've made this same argument months ago when the Echo Show debuted. But these new Google Assistant displays are so much better in almost every way. For example, when you make a search query, it won't just spit out a short generic answer with the transcript showing up on-screen; it'll actually appear in a way that makes sense. So if you search for "cornbread recipe," the display will offer an array of recipes to choose from. Tap on one and you'll be presented with a lovely step-by-step recipe guide, all without having to install any additional skill or action. Or if you ask a Google Assistant smart display to play relaxing music, it won't pick out a random playlist and start playing a song you don't want (something that happens quite frequently with the Echo). Instead, it'll offer a visual selection of playlists, which you can then scroll through and pick the one you want. Perhaps my favorite feature is when you ask for directions. It will not only show you the map on the screen but also send those same directions straight to your phone without you having to ask. 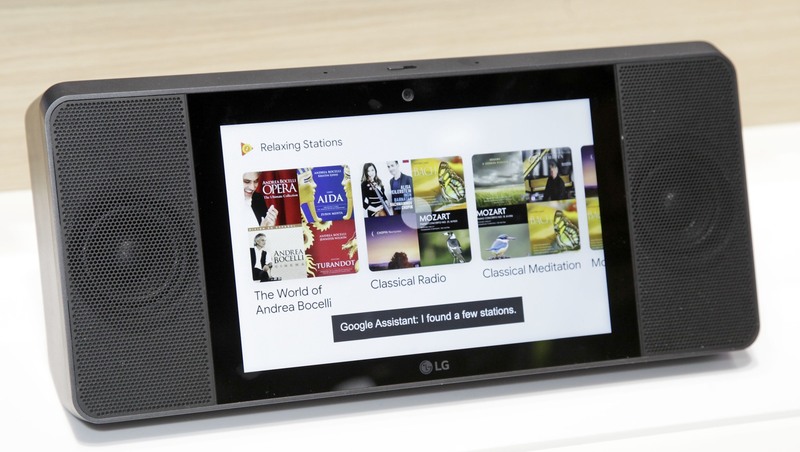 Plus, Google has now opened the door for so many more companies to start making smart displays. At CES, we saw Lenovo, JBL and LG show off their versions, each with very different designs. Eventually, even more companies will join the fray, adding their own spin on what a smart display looks like. With so many options on the market, there'll soon be a smart display for every kind of home. Amazon might've introduced the smart-display concept, but Google will be the one to democratize it. And this is just the beginning. Smart displays can be incorporated in more than just a little 10-inch prop on the table. Personal assistants are already in smart fridges from LG and Samsung, so it doesn't take much imagination to think that Alexa and Google Assistant displays could take over the rest of your home. Imagine a smart display not only on the front of your fridge but also in the kitchen TV or maybe the bathroom mirror. Soon smart displays will be everywhere. CES 2018 was just the beginning.